Fantasy–not my thing, I cover my ears in my writing group whenever this genre is discussed. Yet I believe in the fantastical notion that what I think about in the middle of the night when I get up to pee–or to put it more politely to “answer nature’s call”–I will remember word for word in the morning. You know how this fantasy ends. Except for last night. At 4:30 a.m. (I suppose that makes it this morning and late enough that I could have gotten up for the day) I grabbed the little notebook and pencil on my nightstand and wrote out four pages of diverse thoughts. Some were for my book “Claire” and others for this blog. Or at least that’s what I wrote. It would be incredibly rewarding if only I could decipher what all those scribbles are. Or, of the ones that I can actually read, what they mean. 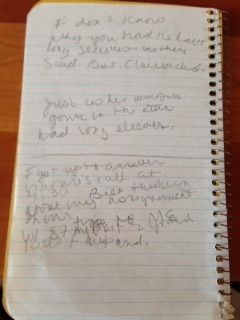 For example, my first note is: “This was the time, Claire thought.” Underline. At our last writing group, I was asked to focus on Claire’s emotional backstory. I’ve been thinking about that during my “free” moments on our recent overnight trip to Ogunquit, Maine, with two of our grandchildren and my eighty-seven year old mother. One germ of an idea managed to surface somewhere between the frigid ocean waves and the heated excitement of Chuck E. Cheese’s. However, the best one came from one of my middle of the night jottings. It connects the bruises on the bride for whom Claire is making a wedding gown with long sleeves to Claire’s wedding gown with long sleeves that is stored in her attic. These two ideas have reinforced the fact that I have been writing “Claire” on a superficial level, unwilling or unable to delve into what is happening in Claire’s mind to cause her to act as she does. I finally get it that her actions will not be acceptable to the reader without a better understanding of her motivations, especially her internal ones. As usual, I know what those are, I simply have failed to commit them to paper. Basic “Novel Writing 101” and something John, our facilitator, has encouraged me to focus on. I can’t wait to get to work on that! Posted on August 7, 2015, in blogging, Karen Whalen, writing, Writing Group and tagged Claire, Fantasy genre, Ogunquit Maine. Bookmark the permalink. 2 Comments. Good laugh is right!! I sure wish I knew everything my mind was processing when I’m sleeping!! You gotta love those middle of the night brainstorms, epiphanies, and eureka moments. They’re brilliant. And you just know they’d thole the assizes of time if only they’d thole until you woke. I need to try jotting ideas down in the middle of the night if only for a good laugh in the morning.